Bath Salt. Milk Bath. Bath Tea. Laundry Soap. COMMENTS: I love these little pouches! The perfect size for fairy dust! COMMENTS: I use these to package my wax tart shapes, but they are very versatile and could be used many ways. Sturdy and excellent quality! COMMENTS: These are great for bath salts and fizzies. Easy to use and look nice. COMMENTS: I used these little bags for my bath fizzie samples! They are actually the perfect size, and the opening at the bottom allows me to get 4 oz worth of dry product in here! That is so perfect, as I was using containers before and was spending more money than I actually wanted to! So these were a great alternative, and I love that they are clear so my customers can see the product! Love it! COMMENTS: Nice, durable bag. I've bought the 5x8 bag & it was way too big for what I needed it for. So I bought the 3x5 bag and it's on the smaller side for what I need them for, but I will definitely find use for it. COMMENTS: I bought these bags to put my dry face masks in. I love how easy they are to use and seal. The zipper seal works nicely over and over again. Yes I had to test it. After heat sealing I thought I would see just how sturdy the seal was. I was unable to open the bag without ripping it. They are good thick bags, almost too thick. I don't think I'd like them any thicker. COMMENTS: I used these to package my Fairy Dust bath powder. I love how well they seal up. There's plenty of room to add my information labels too. Will be buying more of these. "Are these bags food grade? " Staff Answer Since we are not a food packaging facility, we cannot state that any of our products are food grade. "Is it possible to put a liquid product in these bags, such as a body butter or lotion?" 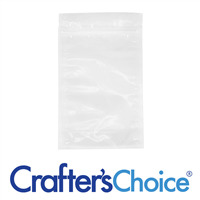 Staff Answer You could add a lotion or body butter to these bags but you would want to test them first to make sure them are compatible with your product. "How many punches of bentonite clay can this pouch hold?" Staff Answer This bag holds approximately 4.8 oz. of clay. "what is the label size for this packet?" Staff Answer You could use a 2" x 3" label but we do recommend having the bag in hand before ordering or designing labels. "Does this bag hold a 4 oz soap bar?" Staff Answer This would be a little too small for a bar of soap. The opening does not open enough to put a bar of soap into the bag. "Hi, is there any reason this couldn't be used for the fizzy bubble powder recipe? Also it is clear correct? (so you would be able to see the powder) Its hard to tell on my computer. Thank you again"
Staff Answer You can use these bags but they are not quite as thick as the clear & silver pouches. And, yes, the bags are clear. 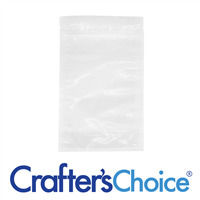 "I have been looking for a Bag, not a bottle, that would be safe for bath salts using Grapefruit or Orange (citrus) essential oils... that won't warp the plastic. Would these bags be safe for that? Thank you." Staff Answer We have not used these bags for packaging salts. Since we do not know the amount of essential oils you are using in your salts, any packaging would need to be tested with your product to ensure proper compatibility. "how many oz will this bag hold?" Staff Answer This bag holds approximately 5 oz. of dry product. "Are these self standing bags?" Staff Answer Yes, this bag has a gusset bottom of 1.5" which would make it a self-standing bag.